Be the first to share your favorite memory, photo or story of Penny. This memorial page is dedicated for family, friends and future generations to celebrate the life of their loved one. Penny (Rutan) Arthur Wright, age 57, of Waynesburg, PA, passed away on Saturday, October 27, 2018 in Rolling Meadows Nursing & Rehabilitation Center after a courageous battle with cancer. Born October 3, 1961, in Washington, PA., she is the daughter of the late James Temple and Aldean (Hopkins) Sanders. Penny was a Waynesburg resident her entire life. She worked for Jacobs Petroleum for eleven years until May 15, 2018. She enjoyed gardening and took great pride in her flower beds. Penny also loved spending time with her grandchildren. She is survived by four children, Billie Jo Arthur, of Waynesburg, PA, Dominique Wright, of Nemacolin, PA, Jasmine Wright, of Waynesburg, PA and Richard Wright III., of Waynesburg, PA; seven grandchildren, Sean and William Lacich, of Pittsburgh, PA, Gage Arthur, of Waynesburg, PA, Bransyn and Rhylynn Wright, of Nemacolin, PA and Lillian and Grayson Cole, of Waynesburg, PA; six sisters, Dorothy Mae Orndoff, of Waynesburg, PA, Judy (Tuttle) Orndoff, of Waynesburg, PA, Dale Lea Gaskill, of Waynesburg, PA, Ethel Pauline (Polly) Caldwell, of NC, Martha Rawson, of OH and Coral Hazel Rutan, of OH; three brothers, Harry L. Rutan, of Rogersville, PA, Ray and Jimmy Rutan, of Waynesburg, PA and Jack Rutan, of Mount Morris, PA; one half-sister, Betty Lou Williams; three half-brothers, Jimmy Temple, Mark Knight and Charles Clutter. 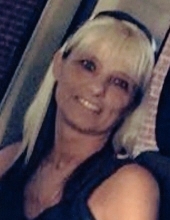 In addition to her parents, she was preceded in death by two sons, William Dale and William Dewayne Arthur; a step-father, Donald Wayne Sanders, and a step-mother, Linda Lou Tucker Temple; two brothers, Dennis and Charles Rutan; two half-brothers, Clarence Shirl Kiger Temple and Butch Barnhart. All services are private and have been entrusted to Kesterson-Rush Funeral Home, LLC. 3275 W. Roy Furman Hwy. Rogersville, PA 15359. Telephone: 724-499-5181. To send flowers or a remembrance gift to the family of Penny (Rutan) Arthur Wright, please visit our Tribute Store. "Email Address" would like to share the life celebration of Penny (Rutan) Arthur Wright. Click on the "link" to go to share a favorite memory or leave a condolence message for the family.